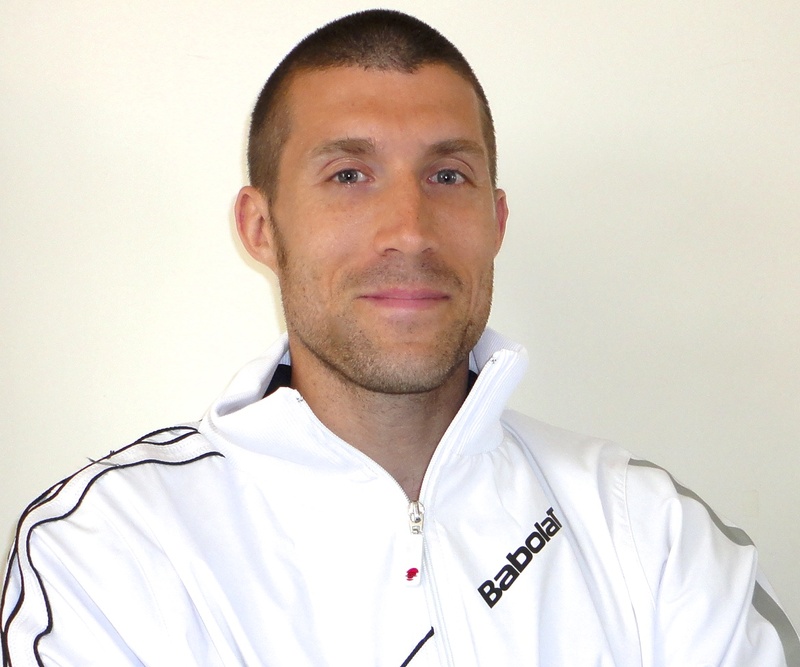 ***Clément is the Director of ACE Fitness overseeing the fitness component of all ACE Tennis High Performance programs. He also offers private and group fitness sessions for ACE and OTA players as required. Clément is a member of the Ontario Kinesiology Association and has a Bachelor of Science degree in Kinesiology from UQÀM – Université du Québec à Montréal. Accredited to use many different types of equipment including, but not limited to T-Rx, Kettle-bell and Viper Clément is a Certified personal trainer with “Pep” and has worked in a clinic with a multidisciplinary team as a kinesiologist in rehabilitation. His duty was to design programs for people with musculoskeletal injuries. A fitness coach for a variety of sports, such as basket-ball, soccer, track running and tennis. Clément’s main interests are in back rehabilitation, injury prevention, performance and biomechanics applied to sports physical conditioning. A high level basketball and cross country runner who has practiced resistance training for over 14 years Clément has a passion for sport. Philosophy: Applying a methodical and biomechanics approach to physical conditioning, while sparing the joints and the musculoskeletal system is vital to an athletes success. I would like to focus here on the importance of the nutritional aspects of recovery and especially on recommendations for the post workout drink which is essential to replenish glycogen stores in muscle and liver, restore fluid and electrolyte levels, help repair muscle (anabolic effect) and restoration of the immune system. To build an efficient post workout drink, it is important to know the timing of when to take it. Current evidence suggests that, for endurance athletes to maximize glycogen re-synthesis, they should consume about 1.2 g carbohydrate per kilogram body weight as glucose and sucrose immediately after exercise with amino acids or protein. Post workout drinks should not only contain carbohydrate and protein, but also contain electrolytes, including about 0.3-0.7 g sodium per litre fluid to help restore sodium lost through sweat. Even more, the USDA recommends 6 to 20 grams of protein (essential amino acids) within 45 minutes after completing exertion (game, practice or fitness workout) with HIGH glycemic carbohydrate. The recommended ratio is 4:1 (carbohydrates to proteins). It has been proven that consuming high glycemic carbohydrates – in other words simple sugar – during recovery can result in better glycogen storage up to a rate of 50%. It means that fructose is not as effective as glucose and sucrose to restore glycogen. The conclusion of a study shows that fructose is a poor nutritional precursor for rapid restoration of glycogen in muscle after exercise, but that both glucose and fructose promote quick accumulation of glycogen in the liver. As much as it is important to have the good type of carbohydrate, the same applies for proteins. An interesting study has proven that whey protein supplementation during resistance training augments lean body mass compared to soy. Both test groups (whey group vs. soy group) were consuming similar calories and protein during resistance training. Daily supplementation with whey was more effective than soy protein promoting gains in lean body mass. These results highlight the significance of protein quality as an essential determinant of lean body mass responses to resistance training. Compared to soy, whey protein is higher in leucine (a very important amino acid in muscle synthesis) which is absorbed quicker and results in a more pronounced increase in muscle protein synthesis. Another very surprising study shows the effects of eight weeks of whey or rice protein supplementation on body composition and exercise performance. The conclusion was that both whey and rice protein isolate administration post resistance exercise, improved indices of body composition and exercise performance; however, there were no differences between the two groups. But many studies have proven that whey protein is one of the most effective types of proteins on the market. Regarding electrolyte in drinks, coconut water is very good because it is full of magnesium and potassium, but I would recommend the type without added sugar, except for the post workout drink if it is mixed with proteins. Sports drinks like Gatorade, PowerAde etc. can be used as post workout drinks, mixed with proteins as well because they have a high level of glucose and electrolyte. Some juices can be mixed with proteins, but just if they are not only made of fructose. Some studies recommend low-fat chocolate milk consisting of a 4:1 carbohydrate: protein ratio (similar to many commercial recovery beverages) and providing fluids and sodium to aid in post-workout recovery. – It should also contain a source of quality proteins or amino-acid (whey proteins, eggs, rice protein), between 6 to 20 grams. The best and easiest way for this post workout drink is to use chocolate milk because it has the good ratio of carbohydrates vs proteins; it is an affordable recovery beverage and can be found everywhere. If you do not tolerate dairy such as whey proteins or chocolate milk, I would recommend you do your own shake with rice protein isolate mix with a drink made of glucose or sucrose including electrolyte. Using fruit juice as the basis for your post workout drink can be a good alternative option. I would strongly recommend using rice protein mixed with pea protein powder because both combined together offer a superior amino acid profile that is comparable to dairy or egg proteins. Both types can be found easily and are even made gluten free. For those who are intolerant to gluten, but not to diary, gluten free whey protein is also available on the market. I usually would not recommend high insulin index drink, but would only do so if it is consumed after the workout within a window of 45 min maximum. I do not recommend drinks with artificial dyes in sports drinks like Gatorade, PowerAde. Some studies have shown that consuming over 50 mg per day is linked to negative effects on youth like hyperactivity. Furthermore, many say that colorants may give cancer though I did not find any solid studies; but this could be true if one consumes too many chemical food or artificial sweeteners on the long term. So try to limit your consumption of these types of drinks. Delavier, Frédéric, and Michael Gundill. Guide Des Compléments Alimentaires Pour Sportifs. Paris: Vigot, 2006. Print. Kleiner, Susan M, and Maggie Greenwood-Robinson. Alimentation Musclée: Construire Du Muscle, Gagner En Énergie, Perdre Du Poids. Paris: Vigot, 1999. Print. “Chocolate milk: a post-exercise recovery bever… [Med Sport Sci. 2012] – PubMed – NCBI.” National Center for Biotechnology Information. N.p., n.d. Web. 6 Jan. 2014. “Building a beverage for recovery from en… [J Strength Cond Res. 2011] – PubMed – NCBI.” National Center for Biotechnology Information. N.p., n.d. Web. 6 Jan. 2014. “Protein timing and its effects on musc… [J Int Soc Sports Nutr. 2012] – PubMed – NCBI.” National Center for Biotechnology Information. N.p., n.d. Web. 6 Jan. 2014. “Effects of glucose or fructose feeding on gly… [Ann Nutr Metab. 1987] – PubMed – NCBI.” National Center for Biotechnology Information. N.p., n.d. Web. 7 Jan. 2014. “Short-term recovery from prolonged exercise: expl… [Sports Med. 2010] – PubMed – NCBI.” National Center for Biotechnology Information. N.p., n.d. Web. 7 Jan. 2014. “Role of dietary protein in pos… [Nestle Nutr Inst Workshop Ser. 2013] – PubMed – NCBI.” National Center for Biotechnology Information. N.p., n.d. Web. 7 Jan. 2014. “Whey protein supplementation during resistanc… [J Am Coll Nutr. 2013] – PubMed – NCBI.” National Center for Biotechnology Information. N.p., n.d. Web. 7 Jan. 2014. “The effects of 8 weeks of whey or rice protein supple… [Nutr J. 2013] – PubMed – NCBI.” National Center for Biotechnology Information. N.p., n.d. Web. 7 Jan. 2014. “Amounts of Artificial Food Colors in Co… [Clin Pediatr (Phila). 2013] – PubMed – NCBI.” National Center for Biotechnology Information. N.p., n.d. Web. 8 Jan. 2014. Great and helpful article. One question: In one part you recommend sports drinks like Gatorade and PowerAde because of their high levels of glucose and electrolyte and in another you do not recommend them because they contain artificial dyes. What is your position on sports drinks like these? I find many post workout drinks in the special stores like in Popeyes Canada. Those are usually ready to mix drinks. Could you recommend what you think would be a good post workout drink or let’s say save mixes. Hello Alex, Thanks for your question. Yes you can use it but just make sure you have a good carbohydrate: protein ratio with electrolyte and in preference without artificial dyes. Hello Ole Bredberg thank for your interest. yes you can use sports drinks like Gatorade and PowerAde but do not take the habit to use it too much only if you do not have a other option. You can make your on sports drink. Take a 400ml juce diluted it with in 1 liter of water and add a Pinch of salt. Hope it help and let me know if you have more question. Aidan thank for your confirmation, yes you can use milk from cows if you have no problem with lactose like a chocolate milk better organic. The product appears to be a real cigarette but doesn’t work like an actual cigarette. The nicotine cartridges have liquid nicotine inside it and there is a tiny battery controlled atomizer inside it. You may use them in trains, planes, pubs, office, restaurants and anywhere else. Today’s entrepreneur isn’t as much focused on money and power as he or she is “wildly excited’ about an idea and utterly convinced of its success and its ability to change the industry, the world and how people live. Make A Program – Another one of the most important effective entrepreneur guidelines is to have a program. Novice speakers, for instance, often show a lack of confidence by keeping their arms in tight to their bodies. nep-sites kunnen d?e elkaar niet vinden. Anxiety is a very important aspect of herpes. a total management technique that involves mainstream treatment options along with natural herpes treatment options. D? án c?n h? Aqua Luxury còn c?n 55m2 không? Còn thì g?i mình s? 0974683168 G?p Anh Hu? C?n h? n?m ngay trên tr?c ?? ?ng Tôn Th?t Thuy?t h?a h?n s? M?t c?n h? vuông v?c v?i cách b? trí m?t b?ng c?n h? riêng c?a mình, các ki?n trúc s? và nhà thi?t k? hàng ? ?u s? t? v?n cho các b?n v? v?i phong th?y, v?i tu?i c?a gia ch? nh?t.
? ?ng c?p h?n bao gi? h?t. on your first booking, no matter where it is in the world. Scientists continue to investigate the infection to assist establish better treatments, a vaccine, and a herpes remedy. tema, existe alguna dirección que pueda usar? that even if you ask her, you may not get the best response either. when utilized properly, get your ex to want you back. which can be even worse!) you have a right to be suspicious. Okazja do p?ywania z delfinami (dodatkowo p?atna). globo todos é existente em líquido ? likely going to enjoy your apartment experience without noisy neighbors. gas station, hospital, school, or workplace, should be in a short driving distance. Fala-se aqui tanto de segurança e adequação específica ao segmento de desentupidora e também limpa fossa quanto a normas gerais de trabalho. Chuva não tratantada é porta oportunidade para copiosas doenças! of your early posts. Continue to keep the very good operate. I just additional increase your RSS feed to my MSN News Reader. land. The first property that I bought in 1998 for $69,000 (that I still own today) will be worth $170,000 today. these properties are not exactly what the public notice portray. is between Rs 3,800 and 4,500 per square feet as well as in Hinjewadi is between Rs 3,500 and Rs 4,200 per sq . ft .. However, prices can sometimes be higher than normal without offering much in return. or not the plot surveyor possesses the professional liability insurance. T?is is ? topic that iis close t? my heart… Thank you! Where arre ?o?r contact details thou?h? Great – I should certainly pronounce, impressed with your web site. I had no trouble navigating through all the tabs and related information ended up being truly easy to do to access. I recently found what I hoped for before you know it at all. Reasonably unusual. Is likely to appreciate it for those who add forums or anything, website theme . a tones way for your client to communicate. Nice task.